Just buy more unpainted sets. Keep them all as they are and paint the new sets to match the mountains. Then you have several distinct cavern environments that are beautiful and useful in their own ways. Pick whichever you enjoying using the most or enjoy painting the most they will all look great. Though mixing with Erinthor may be a big plus. The Erinthor matched set is super flexible and future proof. That's my vote. I agree, that #2 looks best. You might want to drop a few minis on the first two, to compare how they look on the tiles. Sometimes the best looking paint jobs look great by themselves, but when the decor and miniatures are placed it all blends too much and the whole scene becomes a wash. Just wondering how they show off your goodies as you would see them in-game. No need to post, at least take a look for yourself though. I like 2.0 as well. It seems more natural. Very pleasing to my eye. I agree, all three versions look nice, but the middle version is more compatible with a wider variety of existing parts. Here's a look at the three different cavern paint jobs I've got (just now remembered I have lava too, but those aren't in competition for any new pieces). The more I look at it, the more I'm leaning towards 2.0's paint job and overall tones. Going with 2.0 means I can use it with my Erinthor sets, and any future outdoor sets DF does, as I'm pretty happy with my rock formula. I have the feeling that whatever you paint will be amazing. I also know that if ever you paint over anything you have already painted, I will find it a waste. 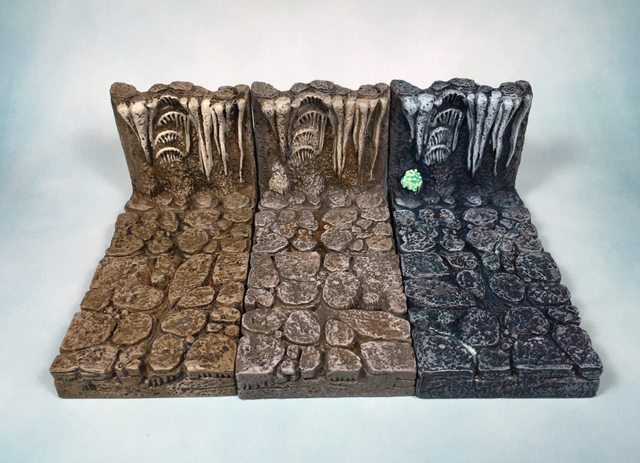 Why not the other way around, paint some of your KS6 piece to match your Erinthor mountain? 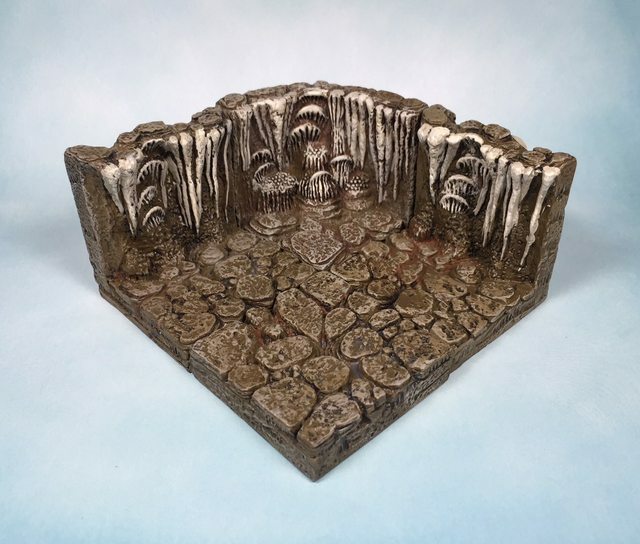 Sorry, no help here, as I'm trying to convince *myself* not to repaint all my caverns when I get the new ones, haha. 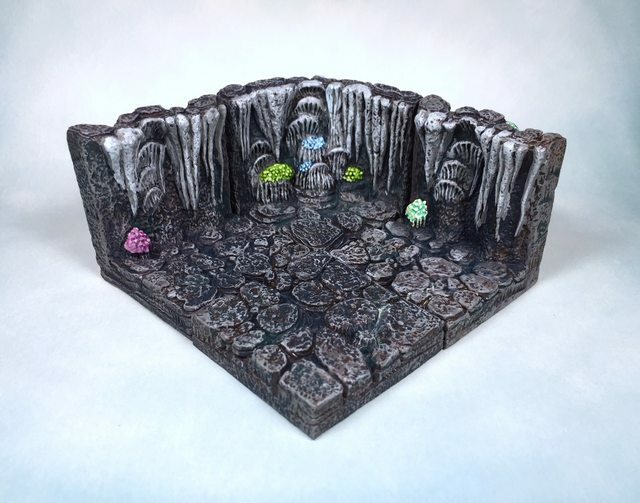 You could easily maximize compatibility by painting everything (KS1-6) in the same color scheme, then all the disparate pieces of all your sets would seamlessly meld together in one gigantic dungeon but...zzzzzzzzzz, boring! 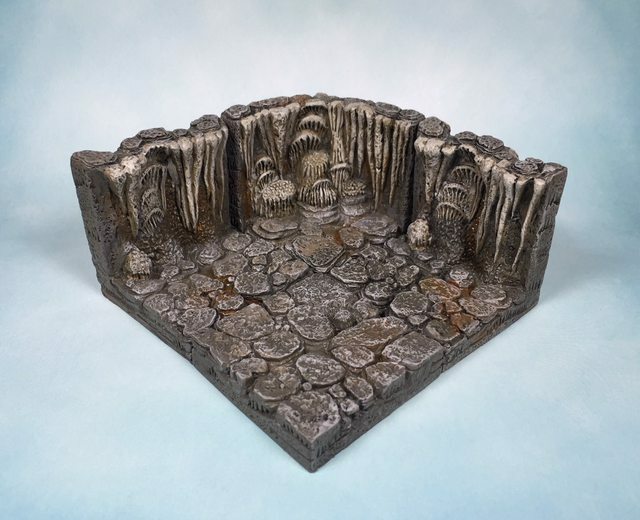 I get that it's hard to look at two sets that look like they want to play so nice together and want to paint them to match, but I think it's overall better for your game to have varied environments to lay out on the table. I think it helps the players get in the mood of each environment when they're different... a bit of mental context switching, if you will, when the physical terrain changes, helping their own mood change. If your cliffs and your caverns are different, I think it helps players adjust how they react when moving from one to the other. FWIW I like the mountain scheme more than the brown scheme.